I picked this wine up at Home Liquors in Verona and thought it was a Malbec from Mendoza, Argentina. upon closer inspection I found that the wine's label gave no indication of its nature other than the proclamation of "Porteno 2005 Red wine Mendoza, Argentina." I became very curious. 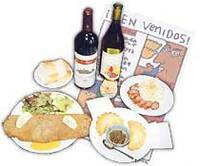 According to Wikopedia Porteño is the Spanish demonym for those born in the Argentine city of Buenos Aires. Its feminine form is Porteña. It is also a cocktail that The Professor a San Francisco Bartender whips up on Demand Portena Cocktail. 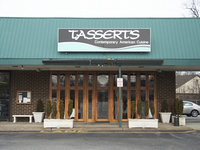 Made a wonderful discovery in Florham Park, Tasserts is just the kind of restaurant I love. They have been around since 2003. I am surprised I have not heard of this restaurant before. Tasserts combines "New York sophistication with an innovative menu. Focused flavors that are so well balanced each bite is a delight. The menu is updated seasonally to showcase the best of the season." 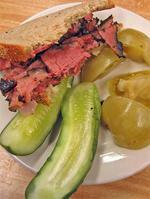 Irving's is a new classic Jewish deli, modeled after Katz's on the Lower East Side. Katz's bills itself as New York best deli since 1888. Irving's may be able to claim that title for NJ since 2007. I've had lunch at Irving's many times and it is a winner. No place to loose weight, but you will walk away with a full happy tummy. Located in Livingston, NJ on Route 10 just east of Okner Parkway. I have always loved the food at Blu, all my friends love Blu. If you have read my past reviews I did not enjoy the room and felt the staff was too casual. Well that has changed. Diana and I met at Blu last night for a fabulous dining experience. I attended a corporate event at the newly created Stonehouse Restaurant and Event Center, on the site of the old Chanticler Chateau in Warren, NJ. The restaurant and facility is spectacular. A last minute dinner invite brought me to Raymond's this past Friday night. Stopped by Amanti Vino for a bottle of white. As usual found a great selection in Amanit's perfect temperature wine refrigerator which is around 48 degrees Fahrenheit, not the 35-38 of the average refrigerator, that is much too cold for a good white wine. The chill stifles the flavor. 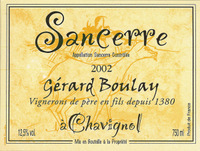 A Sancerre was the selection, Gerard Boulay, Chavignol, 2006. Perfect with the Mediterranean Platter, Truffled Grits and Wild Mushrooms with Fontina Cheese, and a Tile Fish Special we had for dinner. In top 400 blogs list http://alawine.com/wine-blog-rankings.html.